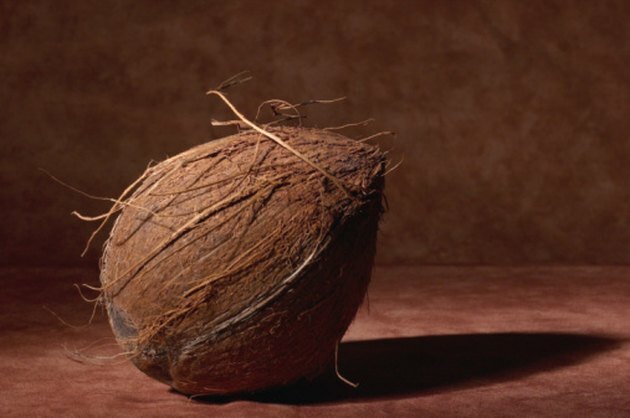 The meat from a mature coconut is used primarily in baked goods or combined with uncooked, finely chopped poultry, meat or shrimp. While coconut milk, made by mixing water with freshly shredded coconut meat, is prized for savory dishes, the used meat is usually discarded. Coconut meat is commonly cooked with sugar, milk and butter to make coconut candy, a treat found largely throughout Asia and the Pacific Islands. Use a coconut grater, which has a flat or round rod with a rounded, serrated end, to remove the meat from the shell. Heat a medium-sized, nonstick frying pan over medium heat for 5 minutes. Pour 2 cups of sugar into the pan. Melt the sugar until it is light brown. Do not stir. Pour in 4 ½ cups of grated, fresh coconut; it takes approximately two coconuts to make 4 to 5 cups of grated coconut meat. Stir the sugar and coconut mixture using a large wooden spoon to completely incorporate the ingredients. Cook the candy for 3 to 5 more minutes, enhancing the color and the flavor. Pour the candy into a non-heat-conducting plastic bowl; the candy will thicken as it cools. Place the bowl in the fridge for 10 minutes to speed up the cooling process. Line a cookie sheet with aluminum foil and spray with nonstick pan spray. Remove the bowl from the fridge. Pinch off some of the coconut candy and roll it into a 1-inch ball. Set it aside. Repeat with the remaining mixture. Cool uncovered at room temperature. To store the candy in your freezer, wrap coconut candy balls by the dozen in plastic wrap. Then, stack 2 dozen and wrap with heavy-duty foil. Place the candy in freezer storage bags in the freezer where they will keep for one year. Caramelized sugar is very hot. Be careful when you add the butter and the coconut to the sugar. How Do I Make Homemade Coconut Oil?